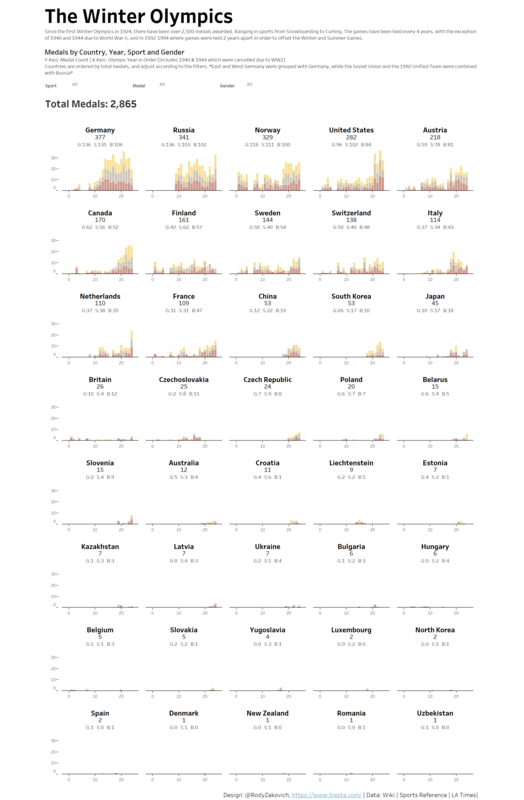 For the start of the Winter Olympics in South Korea, a data viz which shows all medals earned since the first Winter Olympics in 1924 by Country and Medal(Bronze, Silver, Gold) was picked. Overall, I find this to be an appealing viz. It looks orderly and clean. The message is clear and it is easy to find out how many and which medals a country won. The small KPI summary in each box also gives a nice overview of the total medals won and the split of medal ranks. The subheaders are difficult to read. The subheader’s font size should be increased. Comparisons are difficult. The countries are sorted by total medals won so it is easy to compare by this measure but besides this, a comparison between countries, for example by bronze medals, is difficult. The viz’s stretches out very far. It is easy to get lost in the viz since you do have to scroll down quite far to reach the bottom. It would be an advantage to have an overview which does not require scrolling. Looking for a specific country is difficult. The high amount of displayed countries makes it tedious to look for a specific country. A filter or highlighter could solve this issue. Since this is an explorative viz, there is not one conclusion to draw but multiple insights which can be explored. However, the focus lies on the medal count split by medal rank. I chose a scatter plot to show the count of medals won by all countries over the years. I took advantage of the random function to distribute the scatter plot dots randomly within the year column. The rows are split by medal rank. Each row shows the medals won by rank(bronze, silver, gold). The color pallette is explained in the title, so no additional color legend is needed. A country can be highlighted via the drop-down box. This facilitates the comparison between the countries. The selection of a country in the drop down menu results in an increase of the circle size for this country. An overall summary of medals won is displayed on top of the scatter plot. Next Next post: Data Analysts Nanodegree has started!